Children are teachers, and they get paid about as much too. Here are things that I have learned from my four children and the many children I’ve been blessed to cross paths with. 1. Let Them Be Little…and then move on. I’m fairly convinced that one of the reasons I had four children instead of two was that I knew I’d be moping along with an 11 year old and 14 year old missing the pitter patter of little feet. Little children are adorable with their unfiltered mouths, emotions, and cherub faces. Love them, squeeze them, play with them, and then let them grow up. 2. Motherhood is eternal. You never stop being a mother. It is an eternal bond and life sentence. The love, the worry, conception to death and then in the afterlife. 3. Mistakes are Inevitable. I don’t even like the word mistakes, but prefer ‘learning opportunities’ or ‘creative life choices’. That being said, there are many women behind bars (real or imagined) because of a series of these ‘mistakes’. For the more fortunate ones, they are chances to grow, learn, and teach. 4. Children are Free Agents. Children will have natural talents and abilities that we can nurture, but they are really in charge of their own God given gifts. Just because they can draw comic books doesn’t mean you need to look into an internship at Marvel, nor do they have to get into show business because they excel at dancing. It dawned on me when I was more excited about a hip hop convention with thoughts of L.A. than my kid was that I had to step back. I had to give the ninja sleep hold with finger to my lip with a dramatic and comedic ‘SHHH’ as my inner stage mom quietly passed out of my ego. I take this into my writing. While a lot of things take effort, writing comes naturally. It’s enjoyable because I control it and decide what to do with it. It’s also fairly cheap…only shavings of my soul are spent. 5. Never Overestimate or Underestimate a Child. Tough lesson, but children are unpredictable. I’ve tucked a 5 year old into bed discovering a quarter in his mouth and have discovered a 7 year old climb on top of a refrigerator randomly to clean it. They keep you on your toes which brings me to number 6. 6. Never Say Never. My child will never do that, say that, act like that, think that or make ME do that, say that, act like that, think that. L..O…L. Boys were no surprise to me as I found myself babysitting for families with boys throughout my adolescence and adult life (So obviously, God was preparing me to have 3 boys). He knew I’d be stubborn and shoot for the girl though, which is why he had me practice with babysitting little girls. Unlike boys, I’d find myself falling short with this new ‘kind’, but I’d come to realize it was also really good practice to become better equipped for parenting a little girl. That being said, I clearly recall a moment where I witnessed a preteen scream, “I HATE YOU! !” at her mother who was dropping her off at school. Trust me, every time my 5 year old daughter spontaneously says, “I like you Mom”…”I love you Mom”…I have learned to bask in the moment and Never Say Never. 7. Children Help You Face Your Fears. We are loaded with fears, children just help us magnify them. Take a moment and conjure up your biggest fear…..now throw a kid or two in the mix. Like Patsy Cline lamented, “Oh Stop the World and Let Me Off!”. Raising kids is scary and therapeutic all at the same time, constantly pushing us out of our comfort zones. We read the headlines, we may even know the people associated with them, and we might even have to outlive our worst nightmares. These are the cold, hard facts. As a consolation prize you get to write a memoir. 8. Children are Entertaining. Because they cause us such anxiety and financial depletion, children will say and do the darn’dest things. I give you permission to write these things down, take a picture, and even post some of it..whatever you need to do to remember it..but maybe draw a line and don’t overdo it because apparently nobody else thinks your potty shot is funny…including your kid. 9. Children Push You to Make You Better. Anything that teaches you anything makes you better. I’m not saying that people who are parents are better than people who are not parents. Maybe I’m saying children or people who act like children make you better. I don’t know…I don’t write to make friends. I’m just saying that children hold you accountable for your own inadequacies. They point out your strengths and your weaknesses…whether directly (‘You have a big tummy’) or indirectly (Giving you a dirty look after a day long grudge). Children make you WANT to be better. I’m not saying every day will be a success, but children daily refine you to be more patient, understanding, compassionate, flexible, loving, better decision makers, better financial planners, etc. but only if you are open to it. 10. Mommy Guilt Goes Better With Chocolate. Maybe that’s what my book title will be called. Mommy Guilt is like the national debt…it’s never going away and seems to be growing with the next generation. Somehow moms and dads seem to have made parenting some sort of contest. At best I say it’s ‘survival of the fittest’. I’ve experience mommy guilt, daycare child guilt, preschool teacher guilt, and even random stranger kid guilt. Staying awake thinking of ways I could have been better equipped to be a caregiver to children I never birthed…what…ever. The key goes into feeling secure as a parent because you are happy with your choices. While ‘thinking before parenting’ would be wonderfully ideal, it ain’t real life. Parenting is full of impulses, some days we are just 2 slammed doors and 1 f-bomb away from a SuperNanny episode. We do the best we can. Some days are a hit, some are a miss. Heck, some HOURS are a hit, some are a miss. I conclude with a thought of future posts, but a stronger desire for anything chocolately. Sometimes life leads you to places that you never dreamed that you would be. It could be a good place or a bad place. Either way, anything in life is possible. If I think back on where I was last year, I would probably be awake checking out websites for dogs that were up for adoption. Now, I am wide awake because of the websites that tell you the dogs that are up for adoption. We brought Lucky the Beagle home on Jan. 14, 2014 (see ‘Getting Lucky: A Blog with a Dog’) and by early January we just had a hunch that he was not intended to be an only dog. In his shelter picture he has this huge grin on his face and though he seemed content to be settled into his new home with his new people, I was beginning to feel that he needed a little friend. So started the late night scrolls on social media for a friend for Lucky. When we saw that there was a 2 year old Beagle at a local shelter we jumped. Here stood my family (well 5 out of 6) with dog in tow ready to meet a possible ‘candidate’. Lucky sniffed him out and deemed him worthy. If I would have totally denied having a teenager, we probably would have brought this ‘Snoopy’ home. But, honesty has always been my best policy and because of their policy since my WHOLE family wasn’t there….no dice. The second possible candidate was a 7 year old Beagle in a shelter 40 minutes out. I took Lucky and my 4yo daughter and we met with a barking, graying, mounting dog that just seemed to ‘not be the best fit’. Despite having a one week vacation booked, something still stirred within me that said that we should keep looking. I think there was a brief stop at the local shelter to see a Shih Tzu that was quickly a U turn because of the ‘Shouldn’t be with young children’ warning label. It was a Saturday in late February. Six out of 6 of my family members were home. I was tired of looking at dog adoption websites. We were going to get that second dog today. When I saw the shaggy Cocker Spaniels, I was drawn to their subdued demeanor. One was 6 years old, the other was 10, and they had just recently been surrendered. I would like to take a moment to explain my thought process so that you don’t think that I am a heartless human being. 1. I have one dog. 2. I am a new dog owner. 3. This dog is used to living with another dog. 4. I only want to have two dogs. 5. The 6 year old dog is younger. 6. There is a cost to adopting and taking care of dogs. 7. I have 4 kids and I am a little crazy for even being here looking at a second dog. We took ‘Bailey’ into the visiting room and he paced the floor with a content, but oblivious disregard for us. Lucky seemed to be at ease with him. The kids thought he looked like a fuzzy teddy bear. The papers were signed and after a few days of vet visits Bailey would be coming home. I knew that Bailey’s brother Riley was going to be up for adoption, but I knew that he would go quickly. I left my phone number and requested the staff to pass onto the new owners for future reference. I had settled into the thought that the brothers would be starting a new chapter of life. Like when human siblings leave the nest to marry and have their own children, I picture meeting up with some stranger at a park on behalf of a brother reunion where they would ‘catch up on old times’. Riley was older and would be doted on with a new family. It would be fine. Yep…this is kind of what happens when a naïve new pet owner completely falls into a pet store mentality and has no clue about what it means when dog siblings are ‘bonded’. Here I was with my ‘ooh they are cute, I’ll take one’ hastiness, but it really did have some logic to it. “Bailey has been adopted!” announces Facebook. My husband and I quickly became the most loathed people on the internet because clearly we went to the animal shelter to destroy animal psyche. A simple, “I hope they will consider adopting both” would have been suitable or I could even laugh at the response of ‘Who needs a husband?’ to my ‘I’d have to get rid of one husband to get three dogs’ comment, but as with anything on social media, passions soar in somewhat misguided and offensive ways. By this point in my life, I know that it really doesn’t matter what people really think of you….it’s about learning about you and reconciling that to yourself. My husband was feeling the heat and we really had 3 options. 1. Press on and say ‘Hi’ to the haters. 2. Pass on the adoption and let some nice couple get both dogs. 3. Be the nice couple and get both dogs. One prayer, two softened hearts, two open minds and a realization that our lives would be chaotic for the next 10 years anyways later, we couldn’t get back to the shelter fast enough to make sure that ‘Old Man Riley’ wasn’t swiped up. The shelter staff apologized for some of the social media backlash and were able to somewhat condense the fee of the adoption because they were siblings (for which I was grateful). The dogs had to have their ears cleared up before they came home. They were not in good shape (as depicted on social media). I suddenly realized that I could be bringing home 2 deaf dogs. Dear Lord, what have I gotten myself into? Again came some social media critics and I was surprised to see one commenter quietly defending the owner who had surrendered the dogs. “I know the owner of these dogs and she loved them, it must have been really hard for her to surrender them”. I would soon get an inbox message from a friend of the past owner of ‘Bailey’ and ‘Riley’, which would lead me to a phone call with their previous owner. A treasured series of exchanges of information, heart pouring, and pictures throughout the year would follow. I would learn about their birthdays, their love of tennis balls, the quirky way Riley would eat corn on the cob, their sleeping arrangements. I learned that they had the same father, but different mother, but mostly I learned that they were loved. People have to surrender their dogs for so many different reasons. This person had to do what was best for the dogs. She had been working two jobs, had lost a house, had to move elsewhere, couldn’t bring the dogs. One bonus life lesson that I would learn is compassion for people who need to surrender their beloved pets. When they would snuggle on the couch with me I would feel some melancholy that they were not there to help comfort their previous owner who was going through some tough times. I would also look at Lucky who I have no background information about, and wonder what kind of family he came from. Ironically, but completely expected, we brought Bailey and Riley home on my son’s 10th birthday. I picked Joey up early from school, bought him a video game, and we went to pick up our new furry bundles of joy. We had done it, we had actually gone from 0 to 3 dogs in 41 days…who knew? 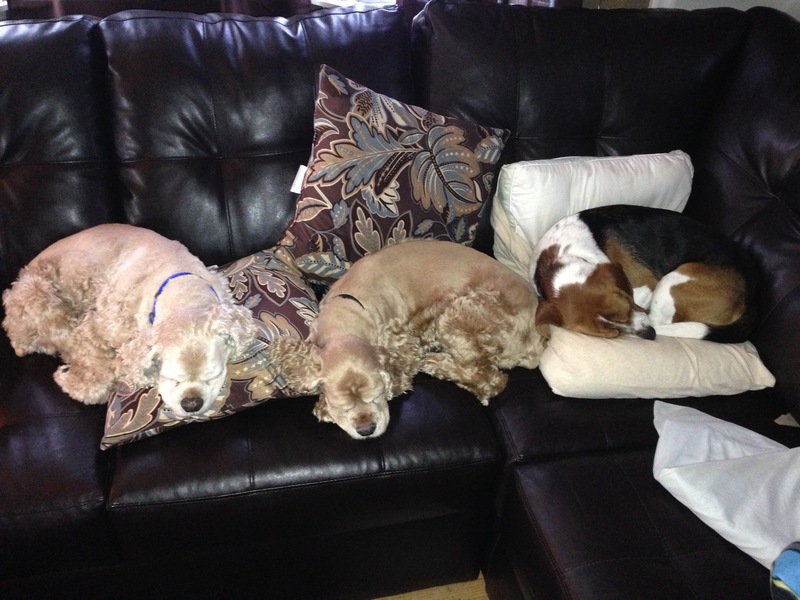 They are family dogs, but clearly they are Mama’s boys…..but more on that with an upcoming ‘Dog Ma’ blog post.